To say that I love this quilt pattern is an understatement. My only regret is that I did not make it bigger. The pattern was designed by Trudi Wood for the Sizzix blog. It's intended to be cut with Sizzix dies. With Trudi's blessing, I drew out the pattern and wrote directions for cutting with a rotary cutter. The majority of the blocks were made by my Stash Sew-ciety Bee-mates. 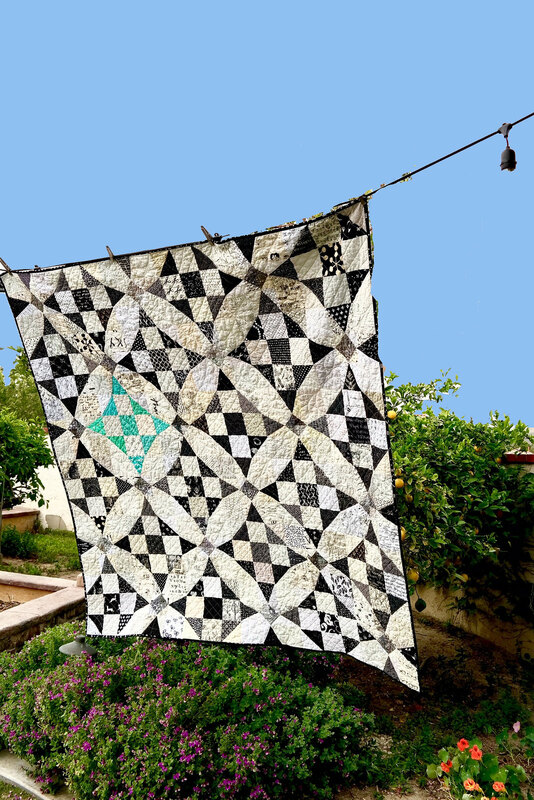 The quilt is made up of two different blocks. 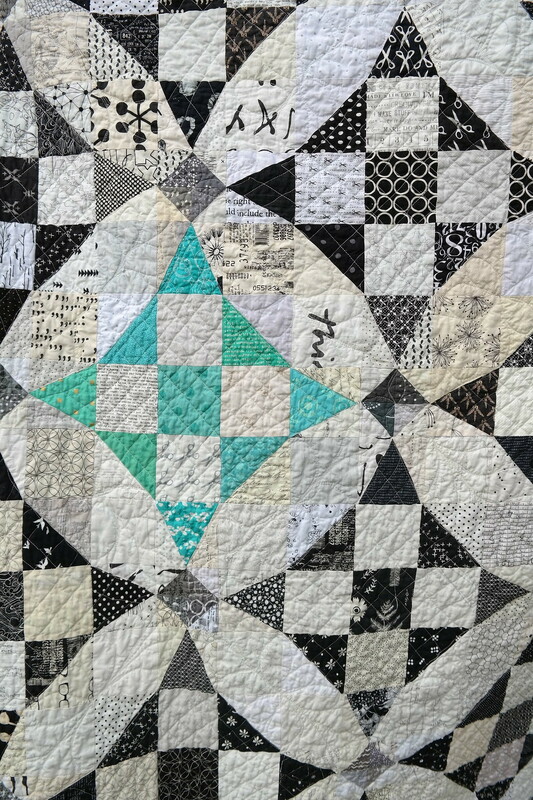 Some are paper pieced and some are traditionally pieced. 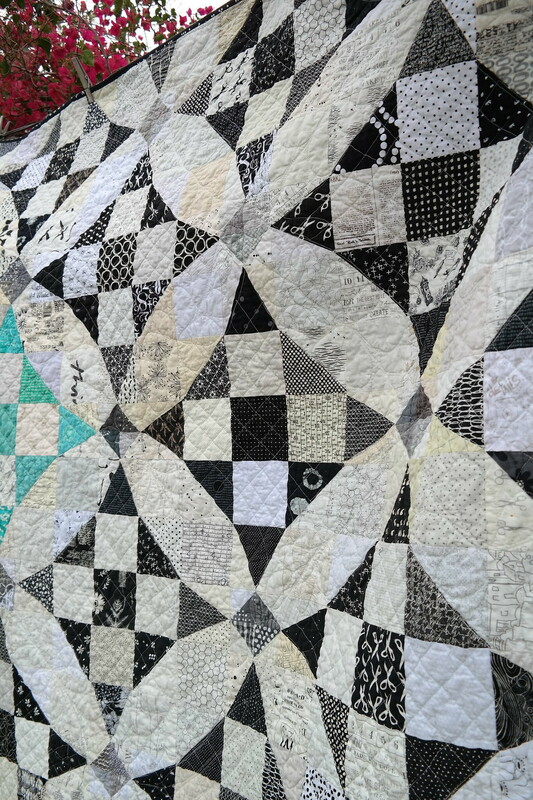 The combination gives the illusion that the quilt has curved piecing, but that's all it is...an illusion! I asked for the blocks to be made using black and white prints, with low-volume (whites, creams and greys) prints and also some dark grey prints for the center squares of block A. At the last minute I had the idea to add the aqua pop of color, so I made those blocks. 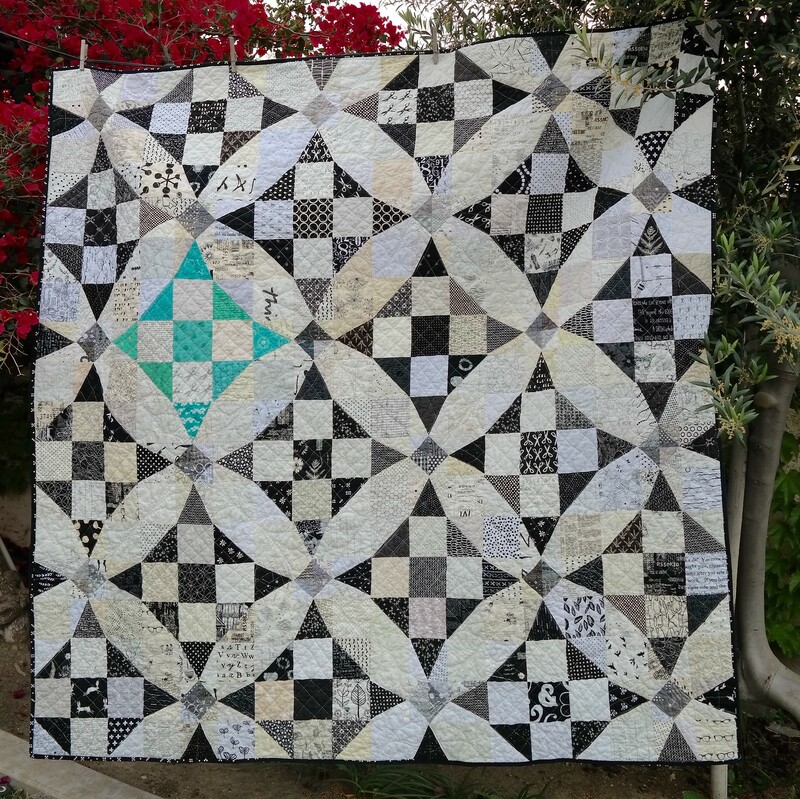 I had great fun free-motion quilting this quilt. I won't win any prizes but I am getting better. I have more confidence to "Just Do IT"! I used a leaf like free-motion stitch through the low volume portions, criss-cross lines through the black and white parts and a four petal flower on the dark greys. I must admit, I was influenced by the way Trudi quilted her Curves not Curves quilt, but I certainly cannot imitate her perfection. Hopefully, someday, I will get there. For the back of the quilt I used one of Anna Maria Horner's prints from her luminous collection. The binding is Domino Dots in Black from Violet Craft's Waterfront Park collection. I have a photo bomber. 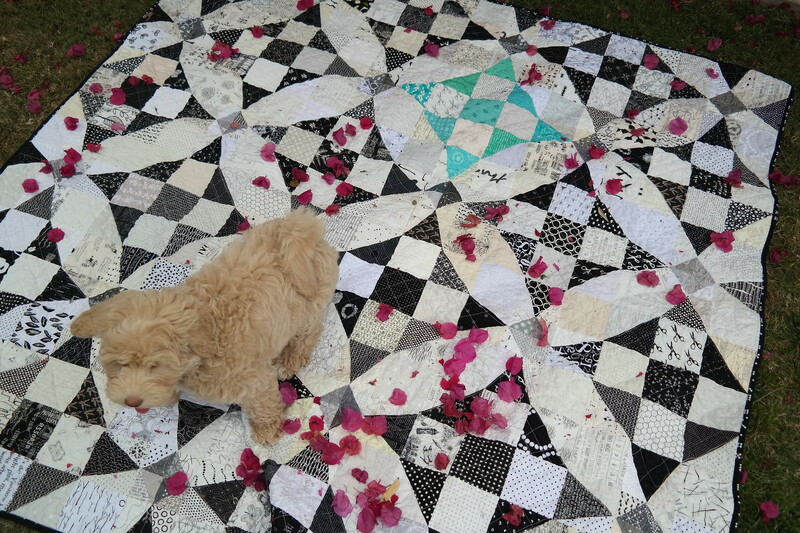 Martha had fun romping on my new quilt, but she wouldn't smile for the camera. Fabric: Scrappy Black, white and grey prints with a splash of aqua, no other color was used. 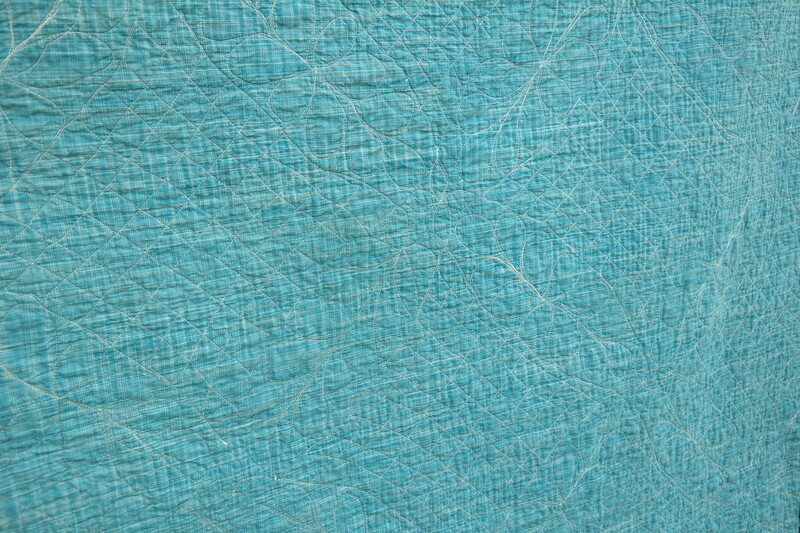 Backing: Luminous Crosshatch is Sea by Anna Maria Horner. Really lovely! Yay for the addition of the aqua! Great minds think alike! ;0) I have just patterned this up as well (on EQ7) and am in prep for starting it! I went queen sized and I think I'm going to do pink for my pop of colour! One if my real favorites Di. Think I am going to have work this into my list!